WoW Insider brings you Spiritual Guidance for discipline, holy and shadow priests. Dawn Moore is a discipline priest by reputation, but still enjoys melting faces as shadow and bugging her raid to click the Lightwell as holy. A while back Spiritual Guidance looked at the various upgrade options for priests in patch 5.2. Today we'll be discussing which of those upgrades you want to take, depending on whether you're a discipline or holy (the weighty topic of shadow will be covered next week). Discipline priests in particular saw some big changes with the release of patch 5.2 and will want to adjust their strategy for selecting new gear from here on. Since we're already talking about disc, let's start there. With that said, let's look at what has really changed: secondary stats. Spiritual Guidance: Discipline and holy priest stat weights and gear in tier 15 originally appeared on WoW Insider on Thu, 04 Apr 2013 19:00:00 EST. Please see our terms for use of feeds. If you walked up and said, "Gray, we've got this Nickelback parody..." I'd probably just turn and run away. I'm not judging or anything, but Nickelback isn't really my thing. I can't imagine how you'd do a good Nickelback WoW parody. And then I saw MMO. With real-to-the-band vocals, that one riff the band does so well, and a real sense of poetry, MMO is actually pretty good. It's leagues better than the original song, which was always a little uncomfortable. But MMO doe a good job of that WoW Widow thing without making the widow out to be the bad guy. The song's a little old, but it's still worth a listen. WoW Moviewatch: MMO originally appeared on WoW Insider on Thu, 04 Apr 2013 18:00:00 EST. Please see our terms for use of feeds. Sometimes, you'd like to know that there are other MMOs out there, right? It's not all WoW, all the time! Our sister site Massively can provide you with everything you need to know about all of the other MMOs around -- past, present and future. Following Disney's acquisition of Star Wars and its related companies and properties, gaming fans have wondered what might happen to developer LucasArts. Out of all of the possible scenarios, the worst has happened: Disney has stopped development in the studio and laid off its employees. Titan rumors are more common than water, but that doesn't make them any less fun to read. The latest rumor suggest Titan is set on Earth and makes heavy use of time travel. Remember that one time when a guy used Diablo III's real-money auction house to bank a cool $10,000? That apparently wasn't what Blizzard foresaw when creating and implementing the auction house. According to former Diablo III Game Director Jay Wilson, the auction house "really hurt the game." Developers speak most candidly about their games and professions at GDC, and at GDC13, SWTOR's James Ohlen laid out exactly how the game's F2P transition ensured its survival. He also dispels many myths that have built up around the game, explaining exactly what costs so much money in game development -- and what doesn't cost much at all, relatively speaking. Jet Li may be known for his martial arts prowess, but he's also an avid gamer according to an interview translation at MMO Culture. Li recently attended an Age of Wushu PvP tournament and had some interesting things to say about e-sports and the validity of video gaming as a sport in general. Don't let WoW Insider do all of the talking when it comes to Massively's best content of the week. The Massively staff themselves have picked out what they think is the best content their site has to offer in their own weekly roundup. Last Week on Massively: LucasArts closes, Titan rumors, and more originally appeared on WoW Insider on Thu, 04 Apr 2013 17:00:00 EST. Please see our terms for use of feeds. Every Thursday, The Overachiever shows you how to work toward those sweet achievement points. This week, Allison desperately wishes to return to the days of "server time." Confession: This article was originally going to be about achievements you could get from unexpected places, because I thought it would be cool to run a column on the areas you pass by a lot without necessarily realizing there are points there for the taking. I'd worked all the way up to Wanderers, Dreamers, and You, which I've been meaning to do for a while but never got around to ... and then I hit a giant road block. Why? This achievement was one of those unintentionally affected by changes in patch 5.1 that altered event times for a lot of servers. Most players will probably remember when the Stranglethorn Fishing Extravaganza disappeared for a few months while Blizzard tried to figure out a way to square it with Cross-Realm Zones. The Fishing Extravaganza returned alongside a new system that standardized most event times across servers in an effort to simplify what was happening and when. The Wanderer's Festival was one of the affected events. After spending hours trying to track down and confirm the event time schedule for servers across the European, North American, and Oceanic servers, I decided it probably merits an article all to itself because the Wowhead thread is a giant rat's nest of conflicting and outdated information. Also, it's not enough to be there while the festival is actually happening, and if you don't get there early, you probably won't have a shot at a battle pet you can't get anywhere else. I am not too proud to admit I need help with this one. The OverAchiever: Time zones, battle pets, and an achievement you probably don't know about originally appeared on WoW Insider on Thu, 04 Apr 2013 16:00:00 EST. Please see our terms for use of feeds. The observant among the WoW community will have noticed that, on the Warcraft side at least, Blizzard didn't put out an April Fool's joke this year. There was a little confusion surrounding this, as Crabby made a reappearance on the official forums, back for another year, and a really excellent piece of fan-created art depicting a Dark Ranger was doing the rounds. The Starcraft team documented the apparent return of the Warhound, and even implemented it in-game, re-skinning all your workers as Warhounds. And while some of the WoW community were happy to amuse themselves with ElvUI's Harlem Shake, or Wowhead's PTR patch notes, others grew increasingly angry that the WoW team hadn't put together a prank for this most foolish of days. Blizzard Senior Community Rep Jonathan "Zarhym" Brown took to Twitter, and to the official forums, to attempt to explain the absence of any seasonal folly. All his posts are after the break, but the long and short of it is that, firstly, while some ideas had been bandied about, nothing had really stuck, and secondly, the team who usually work on the April Fool's jokes had been rather busy with other things. What other things could possibly have taken priority? Maybe Hearthstone itself, the Hearthstone website, or the recent revamp of the shop page, given how Zarhym explains the teams' roles. It seems like Blizzard can't win: last year there were complaints that they wasted Developer time on April foolishness, this year, complaints that they didn't. What's your take on it? Did you wish they had done something? Or would you rather they spent time designing real content? Hit the break for Zarhym's posts. Zarhym on why Blizzard didn't do an April Fools joke originally appeared on WoW Insider on Thu, 04 Apr 2013 15:00:00 EST. Please see our terms for use of feeds. DoT trackers are addons which monitor your DoTs, or Damage over Time effects. If you're playing a class whose damage relies on DoTs, and there are plenty, you should definitely consider using one of these addons. What they do is provide an easy-to-read representation of what DoTs you have on a given target, be it your focus, your target, or any target in the area, depending on your choice of addon. This is important to ensure DoT classes are maximising their DPS, and yes, the Blizzard standard UI does represent them, but the time display is not that clear. To maximise DoT damage, efficient re-casting is key. You should certainly check out guides for your specific class to ensure you're using the right method, whether that's clipping -- replacing a DoT before it's expired -- or allowing something like a mage Living Bomb to explode. It's often useful to be able to start the cast of a DoT to time it with its expiration, and of course, to maintain maximum DoT uptime for the minimum of GCDs and mana, and for all those reasons, you need to track your DoTs. What the heck? Why am I starting with a nameplate addon? Well, dear reader, I understand your confusion, but for PvP purposes, Tidy Plates, or any similar addon such as the built-in ElvUI nameplates, is a pretty decent way to track your DoTs. Addon Spotlight: DoT trackers originally appeared on WoW Insider on Thu, 04 Apr 2013 14:00:00 EST. Please see our terms for use of feeds. A lot of the news lately has been about Hearthstone, the new digital card came announced by Blizzard at PAX. Our own intrepid Dawn Moore interviewed Eric Dodds and Jason Chayes about the game. But with such an interesting game on the horizon, who wouldn't be eager for more? TradeChat got the chance to interview Ben Brode and Jason Chayes about the game. Covering topics like the difference between purchased and earned packs, accessibility, and even the crafting system. It's a pretty cool interview and provides even more insight to the game. Check out the video and let TradeChat know what you think! TradeChat interviews two Hearthstone developers originally appeared on WoW Insider on Thu, 04 Apr 2013 13:00:00 EST. Please see our terms for use of feeds. Really, enjoy it. A friend at my other gig showed this to me earlier this week -- it's been annoyingly stuck in my head ever since. And before anyone goes there, no, there is no hidden meaning to lollipop, the song writer has even come out and said it just means don't get done with your childhood too fast, that love will find you. We know heroic scenarios are coming, and today I learned these are only for premade groups, but I can't seem to find info on whether the new scenarios are heroic only or not. Will I be able to run non-heroic versions with an LFD group? The Queue: Lollipop and removing heroic dungeons from the random LFG tool originally appeared on WoW Insider on Thu, 04 Apr 2013 12:00:00 EST. Please see our terms for use of feeds. Oh, sure, this picture looks all cute and funny. The silly panda bear is being tickled by the tiny dinosaur hatchlings! Look at her laugh! But what you may not remember is that these are genetically modified super-intelligent raptors. Which means that their mouths are filled with extraordinarily advanced bacteria. After this was taken, submitter Máyumi of Area 52 (US-H) had to spend two weeks under quarantine in a Horde field hospital receiving intravenous antibiotics just so she wouldn't spread the next Black Plague. Such pain for a simple screenshot! Around Azeroth: The most adorable mauling originally appeared on WoW Insider on Thu, 04 Apr 2013 11:00:00 EST. Please see our terms for use of feeds. BlizzCon takes place November 8 and 9 this year at the same place it's always been: the Anaheim Convention Center outside of LA. For those that cannot attend in person, a virtual ticket will be made available. And of course, we'll also have around the clock coverage on WoW Insider. Tickets to BlizzCon have normally sold out in seconds (literally), so you'll need to be at your computer at the times above, be very quick, and have a lot of luck in order to get one. Good luck! The full announcement is after the break. BlizzCon tickets go on sale April 24 and 27 originally appeared on WoW Insider on Thu, 04 Apr 2013 10:10:00 EST. Please see our terms for use of feeds. It was a massive multiplayer success for this massively multiplayer game: On March 20, the Thundering Hammer Clan of Feathermoon (US-Horde) successfully brought together more than 120 players from multiple roleplay realms in what might have been WoW's first large-scale, player-run cross-realm event. In bringing together three full raid groups from half a dozen realms, the Kosh'harg roleplay gathering of Horde clans helped demonstrate how to pull off a major cross-realm event and explore the possibilities and limitations of CRZ (cross-realm zone) mechanics. What can other players learn from the Kosh'harg about organizing a CRZ event? We went behind the scenes with Kosh'harg organizer Thorgrun (GM of the Thundering Hammer Clan). WoW Insider: It sounds like the event was a smash success. Congratulations! Thorgrun: The Kosh'harg was an amazing success. At the peak of the event we had three full raid groups and a number of ungrouped local attendees, bringing us up over 120 players from a dozen different realms who joined us in Nagrand for the festivities. How much did you and other organizers know beforehand about realm and zone loads with regard to cross-realm mechanics? We only knew what has been published and widely publicized, namely that the CRZ mechanic is designed to populate low-pop zones with players from associated realms and when population grows to a certain point to split those players off into separate zones. We also knew that players from any North American realm could be brought into any zone on a host realm just by being grouped with a majority of members from that realm - i.e., two Feathermoon players can host a third player from say, Farstriders, in their version of the zone, or alternatively a 5-man group of Feathermoon players could host an entire raid of CRZ players, provided no more than four of them were from the same realm in that particular raid. This is the mechanic that we used to "anchor" our event firmly on one server's seed of the Nagrand zone. Massive cross-realm gathering successfully unites players from 11 realms originally appeared on WoW Insider on Thu, 04 Apr 2013 09:00:00 EST. Please see our terms for use of feeds. Even a glance at WoW Insider's comments section will turn up hordes of devoted WoW-lovers and players who pursue the game with single-minded devotion. That's natural enough; that's what we're here for, after all. But how many of you play other MMOs? Despite the huge number of massively multiplayer online games available today -- enough to keep our sister site Massively a popular internet gaming destination -- do you even have time to indulge in more than one? If you do play more than one MMO, how do you manage your time between them? What games scratch which gaming itches for you? Breakfast Topic: Do you play other MMOs besides WoW? originally appeared on WoW Insider on Thu, 04 Apr 2013 08:00:00 EST. Please see our terms for use of feeds. The third wing of Throne of Thunder Raid Finder was unlocked this week after a short break from the last one. After our previous 5-second guides to the first and second wings, how could we abandon you now? You've almost made it through. If you thought the beasts in the Forgotten Depths were rough, just wait until you meet your new friends in the Halls of Flesh-Shaping. Here's a quick rundown to quickly share with your Raid Finder buddies (thanks for the help Lucid guildies!). There will be a tank swap, taunt at around 4 stacks of Serious Wound. Step into Life Drain to intercept. During phase two, the raid should split itself between the yellow, red, and blue cones. Move each cone around until the three fog adds are revealed, and kill them. Move out of Force of Will and pools on the ground. During the third phase, be patient and navigate the purple maze while keeping ahead of the death beam. In the maze, stuff on the ground hurts, so stick to the cleared melee or ranged path. Tip: Point your camera downward to better view the cleared maze pathing. Kite the boss to prevent him from picking up too many Living Fluids, and kill them. Tank swap at around seven Malformed Blood stacks and avoid dragging him over the purple Volatile Pools. Only tanks should stand in front of the boss. Collect the red Mutagenic Pools on the ground dropped by Living Fluids to become mutated, DPS the boss. Avoid the red pools when you are mutated. Throne of Thunder: Halls of Flesh-Shaping Raid Finder bosses in 5 seconds originally appeared on WoW Insider on Wed, 03 Apr 2013 20:00:00 EST. Please see our terms for use of feeds. I took advantage of one of the many Blizzard sales to get The Spawn's account up to date through Cataclysm a few months ago. We made a pandaren duo together and played through the Wandering Isle, choosing Horde, my faction of choice. This is the first time playing together when she's been able to read the quests without my help, so she's a real partner instead of a tagalong. The experience has been illuminating. 10 things I learned from playing WoW with my 7 year old originally appeared on WoW Insider on Wed, 03 Apr 2013 19:00:00 EST. Please see our terms for use of feeds. Cowboy Astalder serves as a guild recruitment video, wrapping its alluring message in a smooth parody of Cowboy Bebop. Even if that show isn't your thing, you should still be able to enjoy the hip animation, clever use of color, and entertaining music. I'm not sure the guild is still recruiting, since this video is a few years old. But since a good video can last forever, a few years late isn't too late to enjoy this awesome piece of work. Nice job, Adorias! WoW Moviewatch: Cowboy Astalder originally appeared on WoW Insider on Wed, 03 Apr 2013 18:00:00 EST. Please see our terms for use of feeds. Finding easter eggs in video games is always fun, and Blizzard Entertainment has always had some very good ones. This year it would seem though they took the Noble Garden Festival to quite the literal extreme. If you find yourself in the Throne of Thunder, specifically in the lair of Ji-Kun, you will find that all of the eggs surrounding the hatching eggs have been replaced with Noble Garden counterparts in all their bright and vibrant colors. I personally never pegged the Mogu as ones to celebrate the holiday, but maybe, just maybe we've misjudged them a little bit. Little things like this that are always fun to find, and it's amusing how many little details can sneak their way in to what some folks consider the normal routine of their daily wow life. Whether it is noble garden eggs in a raid zone, or Winter Veil Lights in dungeons, little touches like this are welcome surprises. Makes me wonder if anything else has been altered, even slightly, in Pandaria for our Noble Garden festivities. Are there other little changes like this for this year? Throne of Thunder easter egg originally appeared on WoW Insider on Wed, 03 Apr 2013 17:00:00 EST. Please see our terms for use of feeds. The good folks over at Wowhead have been very busy indeed datamining away in the recent patch 5.3 PTR update, and discovered two new mounts, as yet un-named. They're referring to them as "Pegasus" mounts, likely because they're flying horses, makes sense after all. Given that we know very little about them, apart from what they look like, it stands to reason that we also don't know quite where they come from. It should be noted, though that they're in the two colors that neatly align with those of the game's factions. Perhaps a clue? This suggests that the mount is faction-specific, so, again purely speculating, this might indicate one of several sources. Faction-specific mounts could come from the battle.net store, where buying one item nets you two, such as existing pets. Or, it could be another, similar reward, such as the Spectral Gryphon or Spectral Wind Rider awarded for a successful Scroll of Resurrection. Failing that, and looking a little more on the bright side, it could be a reputation reward available in recolors for both factions. Or, we could be reading far too much into the color element! MMO Champion has a video of the new mount in action. What is your take on it? If it was a pet store mount, would you buy it? Patch 5.3 PTR: Fiery new mounts originally appeared on WoW Insider on Wed, 03 Apr 2013 16:00:00 EST. Please see our terms for use of feeds. No matter what, you name it, everything in the LFR when done wrong screams "the healers will fix it". Dropping the bad where it should not be, no worries, the healers will fix it. Not using your defensive cooldowns, no worries, the healers will fix it ... even in the LFR if you do not follow mechanics it hurts and puts all the pressure on the healers. There are a lot of reasons why the LFR queue is so long these days for the average player -- ilevel requirements (though Blizzard's made it easier to get gear from older raids to address this), the sheer popularity of new content, and, as Ghostcrawler pointed out, tanks and healers who queue with their guildies -- but I think Grumpy Elf has a point. While I've mostly tanked in Mists of Pandaria, I healed my way through the Raid Finder in Dragon Soul, and the number of players who took unnecessary or avoidable damage was depressingly high. You expect that with anyone who might be new to the instance, but it wasn't fun seeing a raid with lots of people in normal or even heroic tier 13 ignoring, say, the players trapped in Hagara's Ice Tombs. So for the healers out there, here's a question: Are you queuing for Raid Finder raids? If you are, is the job noticeably more difficult or stressful than it is with your guildies? If you aren't queuing, why not? Why aren't more healers queueing for the Raid Finder? originally appeared on WoW Insider on Wed, 03 Apr 2013 15:00:00 EST. Please see our terms for use of feeds. Let's just be up front about this now -- the Titans left stuff everywhere. It would be hard to disbelieve in them, frankly. They left bases, research stations, fortresses, labs and more. We don't even know what everything they left behind originally did or why it was there in many cases. Some places have somewhat clear reasons for existing (Ulduar, for instance, was tasked with holding the Old God Yogg Saron prisoner, but the Halls of Stone and Lightning point to other goals for the complex) but others, such as the ruined complex now known as Ahn'Qiraj was simply a 'research facility', and we have no idea what it was researching or why such a complex was needed so close to Uldum. At any rate, there are a lot of Titan complexes currently known of on Azeroth. Know Your Lore: Titan facilities of Azeroth originally appeared on WoW Insider on Wed, 03 Apr 2013 14:00:00 EST. Please see our terms for use of feeds. You don't have to be good at math to play a rogue. Anyone can log into WoW and create a rogue. You can get all the way to level 90 and into raids without ever having to do any addition or long division. You can do dailies and dungeons simply by using the highest ilvl gear available and ignoring everything else. Rogues are played with a keyboard and mouse, not a pen and paper. However, if you want to wring every last drop of DPS out of the class, you're going to have to get your hands dirty with numbers. I love when a class' design forces the player to make tough choices. The choices that we make as rogues, when you think about it, are really just math problems. The secret to making good choices is to do the math ahead of time. You don't want to be faced with an unexpected set of fractions in the middle of a tough raid encounter. Encrypted Text: Learning the rogue calculus originally appeared on WoW Insider on Wed, 03 Apr 2013 13:00:00 EST. Please see our terms for use of feeds. Before I write anything else here, the issue to be discussed in this article will no longer exist in patch 5.3 if the changes announced in the PTR patch notes from May 22 survive. For the record, I think this is one of the best changes to come along in a while, as it should reduce queue times for the Raid Finder significantly, while also being a great quality-of-life bonus for anyone trying to gear an offspec. However, it's still a problem at the moment. After reaching level 90, I ran heroic after heroic obsessively in order to scrape the ilevel needed to enter the Raid Finder. After a few drops and the generosity of a guild leatherworker, I cheerfully queued as a tank for Vaults, and then went off to do dailies, figuring that the wait might be a little longer than normal given the popularity of new raid content, but it probably wouldn't be too bad. 30 minutes later, I shrugged and thought to myself, "Well, everybody's running LFR now." 52 minutes later, it occurred to me while yanking pink turnips out of the ground that I had been a little overoptimistic about wait times. Oh well. The farm wasn't going to tend itself. An hour and 20 minutes later, I tabbed out of the game to check the forums, wondering if others were complaining about queue times, or if I'd just had a stroke of really bad luck. Nope. Wait times for tanks through LFR, as a legion of enraged forum posters screamed, were through the roof at the beginning of the expansion. Right now, it seems like DPS players are getting the lion's share of agony. Rather than wait it out, many -- perhaps most -- tank players chose to exploit a loophole that allowed them to get a raid more quickly on a less easily-filled role. Continue reading The Azeroth Ethicist: Is it cheating to trick the LFR loot system? The Azeroth Ethicist: Is it cheating to trick the LFR loot system? originally appeared on WoW Insider on Wed, 03 Apr 2013 12:00:00 EST. Please see our terms for use of feeds. If you're the sort of person that likes mobile games, pick up Dungeon Village. Build and maintain a village to attract adventurers, who will spend their hard-earned gold pieces on your fine wines and steaks! It's fascinatingly fun in the same way that Recettear turned out to be. So...why did Blizzard not have an April Foolz prank this year? Was it just a matter of focusing on their work? I'm actually totally fine with that, but it made me sad. The Queue: Vicarious adventures originally appeared on WoW Insider on Wed, 03 Apr 2013 11:00:00 EST. Please see our terms for use of feeds. It's the Songbird! Kill it! Kill it with a shotgun! Wait, no, it's just Aranela of Dark Democracy on Durotan (US-H) showing off some of the new fight mechanics in the Roost of Ji-Kun. That's what I get for playing BioShock Infinite at three in the morning. Note to self: after midnight, only play Lego Harry Potter or something equally happy-happy-joy-joy if I ever want to fall asleep again. This is why I never finished Dead Space 2. Around Azeroth: Will the circle be unbroken originally appeared on WoW Insider on Wed, 03 Apr 2013 10:00:00 EST. Please see our terms for use of feeds. Everyone's favorite firelord, Lil' Ragnaros, is on sale for one week only, at a fairly massive 50% discount! What do you get for your hard-earned money? Well, Lil' Ragnaros is far more than just a very adorable miniature elemental overlord, he's also a cooking fire, allowing you to cook to your heart's content without rifling through your spellbook for that pesky icon. What's more, he'll cull any critter that should stand it his way, ensuring a speedy and safe passage through all the planes of Azeroth. Lil' Ragnaros takes a break every now and then to pop back to the Molten Core, usually when you start moving, as he only brings his lil' legs out on very special occasions, and when he's quite a lot larger and angrier than his pet form. Don't worry, though, he'll re-emerge from the plane of fire when you stop running around. What's more, he's also a battle pet, a mythical elemental to be precise, of rare quality on purchase. He's strong against mechanicals, but his abilities are generally weak against critters. Probably why he spends so much time wreaking his fiery revenge when he's hanging out by your side. You can see all his stats over at Warcraft Pets. Pick him up at the Battle.net Store, or the EU Battle.net Store for EU players! Lil' Ragnaros for a lil' price! originally appeared on WoW Insider on Wed, 03 Apr 2013 09:00:00 EST. Please see our terms for use of feeds. Leveling in World of Warcraft is a rite of passage that we all must go through in order to reach max level where we can play with our friends. Though for alt-a-holics -- and I'm starting to think I may be one of them -- leveling is the whole point of the game. But whether you're leveling for the first time or the hundredth, whether you're speeding through or taking time to enjoy the scenery, chances are you have your own way of going about things. So when you're on the leveling treadmill, what's your choice? For my part, I tend to quest through zones -- especially if they're zones I haven't been through before. But if I'm stuck in zones that I've been through before, perhaps many times before, things get awfully tedious, thus ending my life potential alt-a-holism. But do you quest, dungeon, subsist on dailies and rested XP, or something else entirely? Let us know, so we may commiserate about the leveling treadmill together! Breakfast Topic: How do you level? originally appeared on WoW Insider on Wed, 03 Apr 2013 08:00:00 EST. Please see our terms for use of feeds. A wild post has appeared on the EU forums, detailing the ground rules for an upcoming "Ask the Developers" opportunity relating to the PvP changes on the patch 5.3 PTR. It's currently locked, but on April 9th the thread will go live for 48 hours, during which time players are encouraged to post all of their PvP-related questions and to vote on their favorites. Don't ignore the voting option, because Blizz will be prioritizing their responses by popularity, and the questions with the most votes are the most likely to be answered. There are also some ground rules for how the thread will work that are typical for "Ask the Dev" designated posts, and shouldn't be anything new for forum veterans. If you're planning on participating in the post, it's worth reading over them so your questions have the best chance of being taken seriously. So far it looks like this Q&A opportunity is only available to those with EU forum access, but we'll keep our eyes peeled for any similar posts appearing on the North American forum. You can find the full blue post behind the cut. Ask The Developers: PvP changes on the PTR originally appeared on WoW Insider on Tue, 02 Apr 2013 20:00:00 EST. Please see our terms for use of feeds. I'm not sure what I just watched. It started off like a beautiful children's book, filled with exploration and wonder and even a cute little frog. Then the music kept winding up and things started getting kind of weird. Then, all of a sudden, frogs were overwhelming the world and they were all friends and it felt like frogs were taking over the world. The animation is decent, even if it has some telltale black line where the models were being lay over top one another. Certainly, it matched the subject matter. While I'm not sure Tell Me A Story would be my go-to video about hallucinogenic drugs, but it'd be pretty close to the top. WoW Moviewatch: Tell Me A Story originally appeared on WoW Insider on Tue, 02 Apr 2013 19:00:00 EST. Please see our terms for use of feeds. Nobody wanted to release anything yesterday, so along with the Patch 5.3 PTR notes and datamined information, we've also got patch 5.2 hotfixes for you. Patch 5.2 must be getting cooler by the second as the number of hotfixes is ever-dwindling, but there's still some bugs that need ironing out. Funny enough, one of them has been hotly (ha!) discussed in our WoW Insider work chat this afternoon, and that is the spawn rate of Noblegarden's Brightly Colored Eggs, which, to the relief of the team, now spawn more frequently. However, given that the hotfixes went in today, maybe there needs to be another one to sort this out once and for all! The click-war continues. Patch 5.2 Hotfixes for April 2 originally appeared on WoW Insider on Tue, 02 Apr 2013 18:00:00 EST. Please see our terms for use of feeds. The WoW Insider Show Episode 287 originally appeared on WoW Insider on Tue, 02 Apr 2013 17:00:00 EST. Please see our terms for use of feeds. Since Blizzard "fixed" the expansion-long "bug" that allowed players to max out their conquest points through arenas or random battlegrounds, rated battlegrounds, which for the purpose of this column will be referred to as RBGs, have become necessary content for players to max out their cap every week. And maxing out your conquest cap every week is, until patch 5.3 at least, something you would do well to be getting on with. The trouble is that finding a rated battleground team is not exactly straightforward, especially if you're a player who's a little new to the PvP side of the game, so WoW Insider thought we'd run down some of our top tips for finding an RBG team. Of course, there's no cast-iron guarantees here -- we can't be absolutely certain that, even if you follow this to the letter, you categorically will find an RBG team to play with every week. That's up to you. But we can arm you with knowledge for your team-finding attempts! This is pretty important, as it's essentially the first hurdle you're going to have for getting into rated battlegrounds. In order to gain entry to a team, whether you're a good PvPer or not, you need to convince people to bring you. Apart from having very high ratings and the like, which isn't usually viable for the newer PvPers this guide is mostly aimed at, one thing people are definitely going to be looking for is gear. How to find a rated battleground team originally appeared on WoW Insider on Tue, 02 Apr 2013 16:00:00 EST. Please see our terms for use of feeds. It's that time of year again! Noblegarden has descended upon Azeroth, granting us bunny ears, chocolates, and even a battle pet. Spring Rabbit is purchased with 100 Noblegarden Chocolate, received when opening a Brightly Colored Egg. You can find the eggs scattered about several starting towns -- think Brill, Goldshire, and Kharanos. There's also a small chance to find the Spring Rabbit's Foot inside an egg, and if you don't want to adventure out into the world at all, there's always the auction house! Although the Spring Rabbit is learned as an Uncommon battle pet, it has the potential to be a very strong member of your team. It's worth considering the upgrade with a battle-stone, since the breed and moveset makes it one of the best of the rabbit types around. Take, for example, the generic Rabbit. The moveset is the same, but the Rabbit is available in six different breeds, which could make capturing the ideal rabbit a pain. Spring Rabbit is always breed 5/15, or S/S, which means that its stats are heavily weighted for speed. Flurry and Dodge become super effective. Adopt a Spring Rabbit now that Noblegarden is here originally appeared on WoW Insider on Tue, 02 Apr 2013 15:00:00 EST. Please see our terms for use of feeds. Fans of free stuff -- and who isn't? -- will appreciate the news that the World of Warcraft Rewards Visa is getting an upgrade. Currently the program offers game time rewards, but the new Blizzard Maximum Rewards program will offer more standard credit card rewards (such as gift cards, merchandise, cash back, and travel rewards) and also "additional Blizzard merchandise," which we're hoping means you can redeem points for pets, server transfers, and the like. While Blizzard's own information hasn't been updated yet, we received this straight from account-holder Orkchop, who received a letter explaining the upgraded program. The program is due to start May 10th, so if you haven't signed up for your own World of Warcraft Rewards Visa, there's still plenty of time to get in on the action: head to Blizzard's website to apply. As is only fitting, you can choose from a number of geeky, Warcraft-themed card designs and even choose to immortalize your own character on your card. Any other questions? Check Blizzard's FAQ. 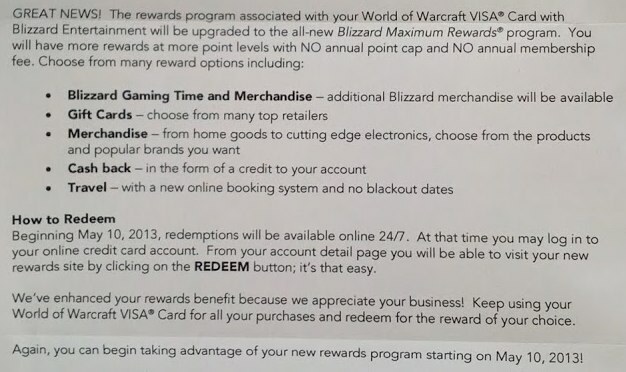 World of Warcraft Rewards Visa is getting a rewards upgrade originally appeared on WoW Insider on Tue, 02 Apr 2013 14:00:00 EST. Please see our terms for use of feeds. Every week, WoW Insider brings you Lichborne for blood, frost, and unholy death knights. In the post-Cataclysm era, death knights are no longer the new kids on the block. Let's show the other classes how a hero class gets things done. Death knights have long been notorious for their insane survivability since they were first introduced. Over the years, a lot of it has been nerfed, but a lot remains. While blood knight survivability feels somewhat obvious, it's a little harder to see what unholy and frost death knights have going for them. Today, we're going to examine how DPS death knights can use their skills to stay alive when the heat is on. Anti-Magic Shell remains one of the most versatile and underrated tools in our arsenal. By absorbing most of the magical damage from a massive magical attack, it allows us to stay in position longer than other classes, and save ourselves from own mistakes in some cases. Lichborne: Survivability for the DPS death knight originally appeared on WoW Insider on Tue, 02 Apr 2013 13:00:00 EST. Please see our terms for use of feeds. Glyph of Mass Dispel: This has changed for the glyph to offer the usual "non-dispellable effect" benefit as something that you have to glyph for.. Ghostcrawler later confirmed on twitter that the cast time reduction is baked into Mass Dispel for Holy and Discipline. Glyph of Unleashed Lightning: Glyph of Unleashed Lightning has been replaced by Glyph of Lightning Shield, which reduces damage taken by 10%. This provides some additional mitigation for DPS shaman, and the ability to cast while moving is now baseline for elemental. Atonement now seems to heal for 80% of the damage dealt, down from 100%. There is a five-minute cooldown Void Shift for Discipline and Holy priests now, but also a new 10 minute version for Shadow Priests. More steps have been built in Dalaran Arena! Patch 5.3 PTR patch notes and datamined changes originally appeared on WoW Insider on Tue, 02 Apr 2013 12:00:00 EST. Please see our terms for use of feeds. In today's Queue we go over LFR trolling, professions, BlizzCon 2013, and cookies. Let's get started, lest we become unstuck in time. Why does Blizz make trash pulls in LFR that are insanely trollable? We had two druids healing last night with Nature's Vigil popped and they kept pulling Tortos over and over till they got caught and kicked. The Queue: So it goes originally appeared on WoW Insider on Tue, 02 Apr 2013 11:00:00 EST. Please see our terms for use of feeds. The druids are revolting! And no, it's not just the rogues losing out on the +agi leather gear that are saying that for once. Submitter Ben and his fellow moose/elk/stag/whatever druids are outraged at the Horde's unjust treatment of Alliance druids. Sure, being killed by the opposing faction is one thing, but being captured, sedated, and forced to provide rides to small orc children at Brewfest is something else entirely. So they've stolen a group of gyrocopters and set off to bomb some Horde ships. Except, as they quickly found out, hooves can't reliably operate the controls of an aircraft, and shapeshifting in midair leads to a quick and splattery death. So much for the druid rebellion. Around Azeroth: Mynd you, møøse bites Kan be pretty nasti originally appeared on WoW Insider on Tue, 02 Apr 2013 10:00:00 EST. Please see our terms for use of feeds. Happy Tuesday morning, everyone. It's a busy week in WoW. Not only has Noblegarden begun, but the patch 5.3 news keeps rolling out. Don't worry though. It may April, but we are not fools. We're keeping up with it all and reporting it to you. Downtime this morning is limited to a series of rolling restarts at 7 a.m. PDT, but there's a lot of news to catch up on. Read on for the usual roundup. You still have a week left to win The Art of Blizzard Entertainment from our contest. The Overachiever has a guide to Noblegarden 2013. Check out the latest patch 5.2 hotfixes for March 27 and March 29. There's some new scenarios and some new content with Lorewalker Cho coming in patch 5.3, and we have a rundown for you. We have a look at the new Shado-Pan Arena coming in patch 5.3. The Barrens and Durotar are undergoing major changes in patch 5.3 as Garrosh's troops take over. Even more battle pets have been found on the PTR. We take a look at some of the new mount models and achievements in the PTR files. We've run some the Heroic Scenarios on the patch 5.3 PTR, and have a report for you. These epic cloaks could be part of Wrathion's patch 5.3 legendary storyline. Ghostcrawler clarified the meaning of that tri-spec achievement discovery in the patch 5.3 PTR files. Last Week in WoW: Springing some news on you edition originally appeared on WoW Insider on Tue, 02 Apr 2013 09:00:00 EST. Please see our terms for use of feeds. You might want to create a new comment profile for today's Breakfast Topic -- but if you don't, we promise not to hold anything you say against you. Very much. Now, scoot a little closer and let's dish. Today's topic: dirty little habits and gameplay secrets. Do you skip reading quest text? Do you have unenhanced gear? Do you ignore performance meters such as DPS meters? Do you purposely slack in PUGs, doing just enough to get by? Do you read, surf the web, or watch TV or movies while you're engaged in group content? Do you select need for all loot without discrimination? What other foibles lie beneath your stalwart Azerothian exterior? Breakfast Topic: What are your dirty little WoW habits? originally appeared on WoW Insider on Tue, 02 Apr 2013 08:00:00 EST. Please see our terms for use of feeds. If you haven't had enough of April Fools' Day quite yet -- and in light of Blizzard's joke no-show this year, maybe you haven't -- you'll enjoy Wowhead's celebration of this silly holiday in the form of what they tell us is new information about patch 5.3 on the PTR. So just what have we got to look forward to? We think the highlight is the new Earth Week holiday, in which we'll be cleaning up Azeroth and battling the forces of evil otherwise known as The Crown Chemical Co. We'll also be fighting a new boss called the Sky Sludge, which drops five epic rings that seem awfully familiar. But if that doesn't strike your fancy, there's also new cosmetic armor and auras, in-game Hearthstone, and the delicious-looking Doritos Locos Feast. April Fools' Day comes to the PTR courtesy of Wowhead originally appeared on WoW Insider on Mon, 01 Apr 2013 20:00:00 EST. Please see our terms for use of feeds. I've been sitting on this UI for a while, and I'm really not sure why, as it offers a lot of great elements. Kiebs, the submitter, send in a very short email, simply because he had very, very few addons to share with us, the majority of the work behind his UI is, as we can see from the header image, covered in the design. Kiebs designs his UI elements himself. He covers this in his very, very brief email, which I'll pop in below. Here's an artsy one for you. I noticed you don't see many of them, but I like designing UI artwork in photoshop, and I use KGPanels to add them into the game. I then rearrange the bars with bartender and change cast bar etc. This is my PvP Monk so... very few addons, I like to keep it real simple. Also threw in my Mage one that I'm working on at the moment for PvE. Like I said, nothing crazy raid worthy, just some fun! Kiebs also sent in several screenshots, showing off his rather minimal UI. Reader UI of the Week: Custom Creation originally appeared on WoW Insider on Mon, 01 Apr 2013 19:00:00 EST. Please see our terms for use of feeds.